Based on a tried and true design, the Condor Crossdraw Vest breathes new life into one of the most popular vest styles on the market. With higher quality craftsmanship than the competition and complete with a MOLLE holster and pistol belt, this vest is perfect for almost any situation! The Condor Crossdraw Vest comes equipped with three double rifle magazine pouches with removable straps and elastic keepers that will hold securely up to six M4/M16 magazines, three AK magazines or six MP5 magazines. And for when that primary rifle runs out of ammunition, this vest can hold up to six pistol magazines; double or single stack! With three on the vest with removable straps, one on the holster and two on the pistol belt, you’ll be able to carry plenty of spare pistol magazines at the ready. The included universal holster is capable of holding most standard-sized sidearms and the small admin pouch is perfect for those necessary assorted nick-nacks! It even has a separate compartment on the back for a hydration bladder and additional MOLLE on the back for more pouches. 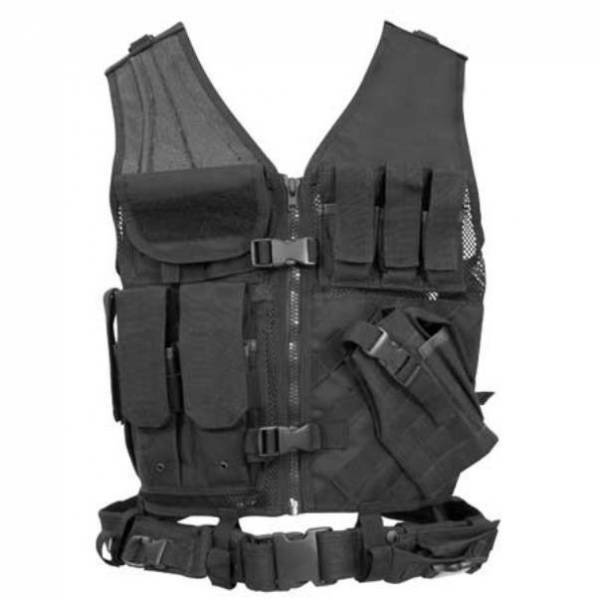 The Condor Crossdraw Vest really does have just about everything you’d find yourself looking for in a tactical vest.